Introduction. The Group P4 . General theory of holistic crystallization. The Groups P2, P1, Pm, Cm. The Groups Pg, P2mm, . The Group P4gm (sequel and conclusion). The Group P3m1 Sequel and conclusion. The Group P31m , sequel and conclusion. The Group P6mm (Sequel and conclusion). Summary of the 17 Plane Groups. 22. The Theory of hidden variables in the sub-quantum level. Further development of the Theory of the Implicate Order. This page (and what follows) is a continuation of the Philosophy Website of Jaap Bax. It is the Third Part of the Website. What precedes this Part can be found when the "back to homepage" link is used. The adress is : http://home.hetnet.nl/~heackel. What will then be found is the First Part of this Website. When one clicks there on the last link of the contents (left frame), the Second Part of the Website can be reached. The address is : http://home.hetnet.nl/~turing. To find the latter directly, one can click on the following link : back to Second Part of this Website. The First Part of this website was concerned with a revision of the Aristotelian-Thomistic Substance-Accident Metaphysics. That revision was accomplished by introducing and integrating into it of the Theory of Dynamical Systems. The search for the intrinsic essence of things resulted in the establishment of that essence -- i.e. the intrinsic essence of a given thing -- namely as being the dynamical law of that dynamical system that has produced, or can produce, that given thing. This dynamical law is already inherent in the elements of the relevant dynamical system. Only things that are intrinsic unities (in contradistinction to being just aggregates) can be considered as possessing such an intrinsic essence. The dynamical law of a given dynamical system that generates the thing is responsible for the intrinsic features of that thing (while external, non-intrinsic factors determine the non-intrinsic properties ("accidents") of that thing). An intrinsic thing was called a "totality", i.e. an intrinsic unity of parts and features resulting in a uniform thing. The philosophical investigation concentrated on such things as organisms and crystals. Both are products of dynamical systems. In order to go into more detail -- after the general metaphysical theory had been set up -- we started to investigate two important and interrelated general effects of the dynamical law in a totality-generating dynamical system : STRUCTURE and SYMMETRY (in and of the generated totality or uniform thing (for instance an individual organism or an individual crystal)). The six Crystal Systems and the 32 Crystal Classes were treated extensively, and after that we embarked on the study of the internal structure and symmetry of crystals. It turned out that this should be preceded by a study of imaginary two-dimensional crystals, in order to ease the (much harder) study of three-dimensional real crystals. Twenty documents were devoted to these two-dimensional crystals. And with that the First Part of the website came to a conclusion. The Second Part of the website continued the study of the symmetry and structure of crystals, but now preparing for those of three-dimensional crystals. It was realized, however, that, to understand the symmetries of three-dimensional crystals, especially the total symmetry of any given crystal, i.e. the symmetry taken up by the internal structure of such a crystal, a study of Group Theory must be included. The reason for this is that explaining the total symmetry of three-dimensional crystals could not be accomplished by just presenting elaborate and detailed drawings, as we did with respect to two-dimensional crystals, because drawings of complicated three-dimensional structures will get unclear, and will likely to confuse the reader instead of revealing insight to him or her. More than twenty documents were devoted to group theory, and it turned out that group theory is a power full general description and analysis of the symmetry, not only of crystals but also of that of organisms. After three-dimensional crystals had been treated, together with some notes on their generation from melts or solutions, we began considering the second category of intrinsic things as products of dynamical systems : Organisms. Also of organisms we concentrated on their general structure (Tectology), and their basic symmetry (Promorphology). The Tectology of Organisms is a general structural doctrine, that sees each organism being built up by morphological units, each of them possessing a certain degree of individuality within the one organism. This tectological structure of an organism reveals that the organism is composed of similar parts (morphological units) that are repeated non-periodically in the organism (whereas in crystals we can see a periodic repetition of certain units). The way these morphological units are configured within the organism can be seen as determining the organism's basic symmetry. The latter will be studied as Promorphology, i.e. the study and systematization of the stereometric basic forms of organisms (We could say a kind of 'crystallography' of organisms). We have then set up a Promorphological System of organic stereometric forms, which means that we express the basic symmetries of a given organism in terms of the simplest geometric body that has these symmetries. In this Promorphological System we also included crystals, which is possible because although crystals do not directly show a tectological non-periodic structure, this structure is nonetheless implicit in them. We retrieved this tectological structure by conceptually removing all translational symmetries in crystals, and so eliminating the periodic aspect of them. What we then get is a motif (which is some chemical unit) that has indeed a tectological, i.e. non-periodic, structure. And of this structure we determined the basic stereometric form. Having done that, we were then able to incorporate the crystal in question into the general Promorphological System. With all this we concluded the Second Part of the website. The present Part of the website -- the Third Part -- will be devoted to a thoroughly holostic view of all of reality, based on the Theory of the Implicate Order(s) of the quantum physicist David BOHM. In the First Part of our website we established a general view of Reality based on an updated Substance-Accident Metaphysics. There the focus was on macroscopic individual intrinsic beings like crystals and organisms. Their metaphysical structure was investigated, and it was established which conditions must be met in order for something to represent a real genuine being (So the "metaphysical structure" of something means the composition of that something, not of physical parts but of principles -- metaphysical causes -- of being). It turned out that (macroscopical) aggregates as well as quantum entities were not genuine beings. The latter were seen as "deficient beings" because of their partial indeterminateness, while the former were not considered to be beings at all because their causes were external to them. The ultimate generative ground -- if such a ground exists -- for all real beings was not investigated thoroughly. We took for granted the existence of system elements, and discussed the generation of more complex entities from those elements in the context of dynamical systems. The system elements themselves were, however, also supposed to be genuine beings, be it more simpler beings. Thus the whole approach was of a rather reductionistic nature, even though the emergence of new properties and structures was granted. The ultimate ground of all (material) things was seen by the notion of prime matter, which is pure potentiality for form, i.e. it is the ontological substrate or carrier for any qualitative and quantitative content ("ontological" means being-theoretic, i.e. figuring in the theory of being in sofar being). Only when in-formed, a being will result, and this in-forming was not considered to be a physical process, but an expression of the basic constitution of things (real beings) out of entities which are not themselves things : neither prime matter, nor form is a thing. In what way the 'first' system elements were created from prime matter was not discussed, because, as has been said, it was not considered to be a process but an ontological constitution. In the metaphysics referred to above the World was conceived of consisting of relatively separated and more or less autonomous beings (things) with definite boundaries and identities. These beings can at times interact with each other, sometimes resulting in more complex beings. While interacting, we could say that those beings were less autonomous : they then were heteronomous. So in spite of there being dynamical processes going on, the World also consists of more or less static objects. And the interaction of those objects (things, beings, system elements) was supposed to be based on immutable eternal laws of nature. A possible totally dynamic world, that is moreover one indivisible whole was, for the time being, rejected, on the ground of the principle of the Co-existence of Motif and Background, which says that for every motif there is also a background, and for every background there is some motif, which in particular means that if we have dynamics we must also have statics (static entities), and if there is some whole there must be some parts either (See for this the First Part of the website -- accessible by the Back to Homepage link -- the document The Substance-Accident Metaphysics and the totally dynamic world in the Critical Series of documents). If I -- or anyone else -- say that nature (or some aspect of it) is so and so, it (in fact) isn't, it is always more than that, and different. In fact this is a statement about our always limited knowledge and about the fundamental creativity and utmost sublety of nature. Reality is always much more subtle than any theory can grasp. This means that any theory about the workings and the constitution of nature is either false or else incomplete, in the sense that its domain of validity is limited. This means that we have to be modest when proposing broad theories about the whole of existence. And this implies that we must be prepared to nourish several different views about the world, allowing them to engage in dialogue with each other, provided of course that such views are the result of serious thinking. So also on this website (consisting of the mentioned three Parts) we will not stick to just one position, as if it were the one and only truth about the constitution of the World. We will investigate other views, thereby, however, not mixing them up, because when we would do that we automatically incorporate contradictions into such a mixed view. So we keep them separate. In fact the most general and fundamental physical theories, Relativity Theory and Quantum Theory, both, each in its own way, point to the World as an undivided and dynamical whole, although not yet thoroughly in every respect. This deserves serious attention, and guarantees the relevance of investigating how such a dynamical whole, not involving separate more or less autonomous but interacting parts, is supposed to be constituted, even if it violates the mentioned principle of the co-existence of motif and background. Perhaps motif and background merge into each other because of their common enfoldment in an indivisible whole. This interplay of motif and background could find its expression also in the two opposing world views (reductionism and holism) which could also merge together into a single theory after they have communicated with each other, exchanged ideas and have removed remaining contradictions. In the present series of documents we will investigate how a thoroughly dynamic world, which is one undivided whole, should look like. In such a world view all the seemingly separate and autonomous or heteronomous things are seen as just abstractions from, or approximations to, an absolutely undivided and dynamic whole that is holonomous, which means that the laws are laws of the whole. And even such broad theories like relativity and quantum theory are just approximations valid in a limited context. Indeed it seems that if we consider the broadest possible context those theories manifest difficulties in explaining some features of the world, or they end up in attributing fundamentality to randomness and chance. With respect to the latter it is our conviction that everything happens in some order, which means that there is in fact no disorder in the fabric of Reality. As is known, quantum theory, in its conventional interpretation, says that the indeterminatenes and randomness of features which it finds all over the microscopic domain, are fundamental. Indeed within its domain of investigation indeterminateness and randomness cannot cannot be reduced to determinateness and order, not even in principle. But, according to the above, every theory, how fundamental it looks like (like in earlier times the newtonian mechanics looked like), is always an abstraction and approximation from a broader order of things. It is established that the randomness of quantum theory cannot be explained by the presence of 'hidden variable'. But we must add not by the presence of hidden variables within the order of the current theory. There might be a further order, much more subler than that within which current quantum theory works, and this order could be responsible for the apparently random behavior concluded from current quantum theory. So the hidden variable could be in such a further order. An example of a certain species of order is our familiar order in which there are local things interacting in a continuous time flow, so this order is essentially sequential. Another species of order could be a timeless order, where everything is present together. Take Brownian motion. This motion we can see when we observe for example pollen grains in water. Under the microscope the grains turn out to be in a very irregular zig-zak motion. This motion is so irregular that one could say it is random (We will however prefer to call such a motion one of infinite order (i.e. of infinite complexity)). Suppose that we did not know of the existence of molecules (in our case, water molecules), then we could consider this random motion fundamental. Indeed in the context of the absence of any molecular theory this would be the end of the story : the grains are -- because of intrinsic reasons -- moving totally irregularly when they are immersed in, or floating on, a liquid, and this motion apparently is dependent on pure chance, i.e. it is apparently indeterministic. And because the liquid would be considered to be a homogeneous continuous medium which, when not locally heated or stirred in any way, is at rest, it does not affect the condition of motion of the grains that are in it. But when we now broaden our context, and include the new theory of molecules, which means that every liquid is composed of molecules that are moving because of thermal energy, then we see that the pollen grains are constantly being kicked to and fro by the collisions of very many molecules (In our case, water molecules). And the motion of each individual water molecule in itself is deterministic and just a motion of low order (which means that we only need to specify a few parameters to determine such a motion, in contradistinction to the resulting very complex motion of the pollen grain which is kicked from every direction by millions of water molecules). The trajectories, each of themselves, of such individual molecules can be regarded as low-order ones. Thus the random motion of the pollen grains is now explained by the molecular theory. The chance movement of the pollen grains can be causally reduced to a deterministic movement of the water molecules. Such an interplay of low-order motion (regular motion) and infinite-order motion (often called random motion) is visible in any isolated dynamical system consisting of interacting particles : In a narrow context where the details are not taken into account the order of motion is of infinite degree. It can even be, under suitable conditions, totally random. But in a broader context, in which these details (which would be, in the absence of any theory about these details, 'hidden variables') are taken into account, it is possible in principle to obtain a deterministic account of the inner movement of particles within the dynamical system. A random order can thus be explained within such a system without the need to take into account any contingencies which are external to the whole system. So we see, that in a way chance is equivalent to necessity. The above treatment, while valid up to a certain point, is, however, still an abstraction and an approximation. For no system can corectly be regarded as totally isolated and self-determined. Thus, most systems of appreciable complexity are capable of developing instabilities, so that they may be profoundly affected even by weak external interactions. And even more important, no specified statement of the laws of nature will be completely and universally valid. For, as has been said already, whatever we say anything is, it isn't -- it is also something more and something different. So it could for instance be that the deterministic motion of the particles of the dynamical system is just an abstraction from a much more subtle and compex motion, for instance one that is like Brownian motion. If that were the case a new order would be revealed in which new structures are possible. And it is evident that between the two extremes -- random order and lowest-degree order -- there is a rich spectrum of intermediate orders. Thus, there is no need to fall into the assumption of complete determinism (although this may in certain fairly broad contexts to be a correct abstraction and approximation). Nor is there any need to assume that chance and indeterminism rule absolutely (though these too will provide correct abstractions and approximations in their appropriate contexts). No matter which system of law may be appropriate in the context that is currently under investigation, there is always room for something more and something different -- something that will be more subtle and that has the ultimate potential for being a manifestation of creativity. (D. BOHM and F. PEAT, 1987, Science, Order and Creativity ). When we look into the history of Science we see that so-called facts are always a product of the interpretation of observations in the light of some more ore less preconceived order, i.e. the observations are made into fact by an underlying conscious or unconscious theory about the general constitution of Reality. Aristotle argued that motion of a body only takes place as long as a force was continually applied to that body. This sounds very natural, because, indeed, when we want such a body to move continually we must continually apply a force, otherwise the body will come to rest. Galileo, however, found out that, as such this is only true when the body moves in some more or less viscous medium (like air). It is not true when the body moves in a vacuum. Indeed the viscous medium is irrelevant with respect to the laws of motion. And it was found out that a force only changes the accelleration of the body (that can sometimes express itself in a curved trajectory of the body. So the laws of motion primarily apply to bodies moving in a vacuum (where there is no friction), which implies that those laws are the same at the surface of the earth and in outer space. And this in turn implies that the earth and the heavens are physically equivalent with respect to motion (which is a basic feature in physics). So a new global order (we could say an order of movement) was sensed, and the observations were now interpreted within this new order. This order emphasizes that the universe is a collection of more or less autonomous objects that move according to the new laws of motion and interact with each other. Also a qualitative change of a body was seen as the rearrangements of its more or less autonomous parts brought about by their movement (inside the body). The latter is clearly brought out by the lens. A lens produces an image of a given object, where there is a fairly exact one-to-one correspondence between the points (parts) of the object and those of the image. So the lens strongly suggests the more or less autonomy of parts of a body. But when we consider a hologram the situation is quite different : We let coherent light from a laser pass through a half-silvered mirror. Part of the light will go on (through the mirror) and arrives at a photographic plate. Another part of the light is reflected by the mirror and illuminates some three-dimensional structured body. Part of that light will now be reflected by that body toward the photographic plate. Before it arrives at the plate it will interefer with the light that passes through the half-silvered mirror, producing a complicated interference pattern that is recorded on the photographic plate. This pattern is not only complex, but also usually so fine that it is not even visible to the naked eye. Yet it is somehow relevant to the whole illuminated object, though only in a higly implicit way. When we now use this plate as a dia, and illuminate it by laser light, and look to it on the side where the light comes out, then we see the whole of the original object, in three dimensions, and from a range of possible points of view (as if one were looking at it through a window). If we then illuminate only a small region of the plate, we still see the whole structured body, but in somewhat less sharply defined detail and from a decreased range of possible points of view (as if we were looking through a smaller window). It is clear, then, that there is no one-to-one correspondence between parts of an 'illuminated object' and parts of an 'image of this object on the plate'. Rather, the interference pattern in each region of the plate is relevant to the whole structured object, and each region of the that stuctured object is relevant to the whole of the interference pattern on the plate (The latter is because we need the whole plate in order to see the object sharply). What is being suggested here is that the considerations of the difference between lens and hologram can play a significant part in the perception of a new order that is relevant for physical law. As Galileo noted the distinction between a viscous medium and a vacuum and saw that physical law should refer primarily to the order of motion of an object in a vacuum, so we might now note the distinction between a lens and a hologram and consider the possibility that physical law should refer primarily to an order of undivided wholeness of the content of a description similar to that indicated by the hologram, and not to an order of analysis of such content into separate parts indicated by a lens. When Aristotle's ideas on movement were dropped, Galileo and those who followed him, had to consider the question of how his new order of motion was to be described in adequate details. The answer came in the form of Cartesian coordinates extended to the language of the calculus (differential equations, etc.). But this kind of description is of course appropriate only in a context in which analysis into distinct and autonomous parts is relevant, and will therefore in turn have to be dropped, in the light of what we have seen with respect to the hologram and also in the light of theoretical findings about wholeness in relativity theory and especially in quantum mechanics. What, then, will be the new kind of description appropriate to our present discussion? As happened with Cartesian coordinates and the calculus, such a question cannot be answered immediately in terms of definite prescriptions as to what to do. Rather, one has to observe the new situation very broadly and tentatively and to 'feel out' what may be the relevant new features. From this, there will arise a discernment of the new order, which will articulate and unfold in a natural way (and not as a result of efforts to make it fit well-defined and preconceived notions as to what this order should be able to achieve). The ideas of David Bohm about new fundamental and more subtle orders that figure as levels of being, from which eventually our 'explicate order' (our directly observed world) emerges, is mainly inspired by the unsatisfactory interpretations of current quantum theory (quantum mechanics). These interpretations involve the need of observers for a quantum event to be actual, they involve fundamental indeterminism (chance), or the splitting up of the whole universe after each observed quantum process. Figure 1. 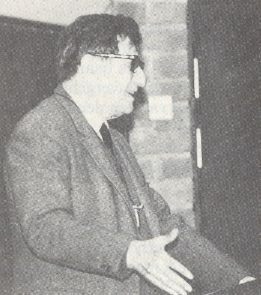 David Bohm in 1987 during a reading about the foundations of quantum mechanics. BOHM proposes that especially the randomness with respect to behavior of quantum entities predicted by current quantum theory is caused by 'hidden variables'. Those variables, however, do not belong to the order which is involved in current quantum theory, but in a different order alltogether, a hidden order of much more subtlety than any known order. And this order determines ('causes') the apparent randomness in behavior of quantum entities. So the interpretation of BOHM, the causal interpretation, does make exactly the same predictions as current quantum theory does, but indicates a cause for the random behavior and so removes indeterminism that reigns in some other (more widely accepted) interpretations of quantum theory. As always in general expositions of typical quantum behavior, the electron, as being a typical quantum entity, is used as an example. This will also happen in what follows. There is an initial form of the theory, i.e. BOHM's causal interpretation, by supposing the electron (or any other elementary particale) to be a certain kind of particle which follows a causally determined trajectory. A later form of this theory is based on the current quantum field theory, involving so-called second quantization, and thus this direct particle picture is then abandoned. In the initial form of the theory the new order that is postulated, and which is causally responsible for the quantum behavior, is the first implicate order associated with the quantum potential which directs the behavior of the quantum particle. The later form of the theory involves a second implicate order (superimplicate order) associated with a superquantum potential, and works within the mentioned quantum field theory in which the fields are considered to be primal (and not the particles). But let's begin with the initial form of the theory (the causal interpretation of quantum theory in the paricle view). It gives a good sense of BOHMS holistic and revolutionary vision of the nature of Reality, here as far as quantum theory is concerned. It is important to put what follows in perspective. In other areas of the study of Nature, especially in biology, there are serious problems with the current attemps to explain all biological features mechanistically, i.e. reductionistically. So for example in evolutionary theory. The key idea of mechanistic evolutionary theory is that organismic types change under the influence of natural selection of certain (progressive) mutant organisms. The (genetic) mutations of such organisms are supposed to be induced randomly by the action of certain environmental agents (for example radiation). So the source of the appearance of new biological types (like birds having apparently evolved from certain reptiles) is in fact randomness. This, however, seems unlikely to be the main mechanism for the evolution of major types in the animal and plant kingdom. This is because for such a transformation (say from reptiles to birds) to take place very many diverse mutations should more or less simultaneously occur, because when initially only a few of them would take place (and later on the others), they would certainly be lethal to the animals having undergone such initial mutations. Indeed it is unclear how many major groups (types) of animals have evolved from other types within this mechanistic paradigm. So problems crop up, and the reason could be that the paradigm has only limited value (It could for instance be more or less valid with respect to minor transformations between closely related types (closely related species)). Already as a result of such problems (which keep on being very persistent indeed) one could look for a new paradigm involving new and more subtle orders. Orders in which organisms depend for their evolution (but perhaps also for their individual development) on some sort of timeless creative whole. And in this way -- and without falling back to obsolete or mystic ideas -- the idea of an implicate order as the holistic ground for all living beings, including their morphology, physiology, behavior and evolution, could arise and be worked out. But it is admitted that that would be a very difficult task to accomplish. However, in physics one indeed has already found two implicate orders, conceptually derived from current quantum theory : and indeed in this way we must see the meaning and relevance of the causal interpretation (of quantum theory) of David Bohm. The next account concerning this causal interpretation in its first form (the 'particle form') is almost litterally taken over from the above mentioned book of BOHM and PEAT (Bantam Books, 1987, pp. 88), because I am not myself a quantum theorist. I am using the results of others, and I am sincerely grateful to them. Unlike the familiar particles of Newtonian physics (as they are legitimately allowed there to be (as abstractions and approximations)), the electron (as a quantum particle, treated in quantum theory) is never separated from a certain quantum field (here the mentioned abstraction cannot be made anymore) which fundamentally affects it, and exhibits certain novel features. This quantum field satisfies Schrödinger's equation, just as the electromagnetic field satisfies Maxwell's equation. It, too, is therefore causally determined. In this expression we see a small triangle. This is the so-called vector gradient operator. We further see the greek letter PSI. It stands for the quantum field, and is formally identical to the wave function derived from Schrödinger's equation (The latter is the law governing the changes with time of the wave function, or the Hilbert space vector). Further we see the letter h , it is Planck's constant, i.e. the quantum of action. And the letter m finally, stands for the mass of the electron or other particle. Clearly the quantum potential is determined by the quantum wave field, or wave function. But what is mathematically significant in the above equation (concerning the quantum potential Q) is that this wave function is found in both the numerator and the denominator. The curious effects that spring from this relationship will be pointed out in due course. At first sight, it may appear that to consider the electron as some kind of particle, causally affected by a quantum field, is to return to older, classical ideas which have clearly proved inadequate for understanding the quantum world. However, as the theory (i.e. the causal interpretation) develops, this electron turns out not to be a simple, structureless particle but a higly complex entity that is affected by the quantum potential in an extremely subtle way. Indeed the quantum potential is responsible for some novel and higly striking features which imply qualitative new properties of matter that are not contained within the conventional quantum theory. The fact that PSI is contained both in the numerator and the denominator for Q means that Q is unchanged when PSI is multiplied by an arbitrary constant. In other words, the quantum potential Q is independent of the strength, or intensity, of the quantum field but depends only on its form. This is a particularly surprising result. In the Newtonian world of pushes and pulls on, for example, a floating object, any effect is always more or less proportional to the strength or size of the (water) wave. But with the quantum potential, the effect is the same for a very large or a very small wave and depends only on its overall shape. 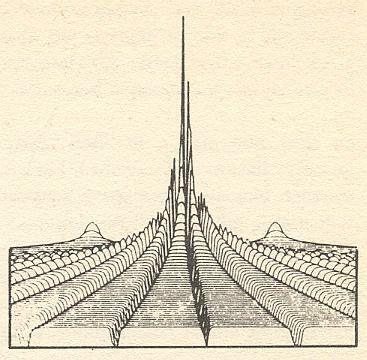 By way of illustration, think of a ship that sails on automatic pilot, guided by radio waves. The overall effect of the radio waves is independent of their strength and depends only on their form, i.e. on the modulation that is superimposed onto a carrier wave. The essential point is that the ship moves with its own energy (while also the automatic pilot works in virtue of its own energy, obtained from its power plug), but that the information within the radio waves is taken up and used to direct the much greater energy of the ship. In the causal interpretation, the electron moves under its own enegy, but the information in the form of the quantum potential directs the energy of the electron. Clearly the term causal is now being used in a very new way from its more familiar sense. The result is to introduce several new features into the movement of particles. First, it means that a particle that moves in empty space, with no classical forces acting on it whatsoever, still experiences the quantum potential and therefore need not travel uniformly in a straight line. This is a radical departure from Newtonian theory. The quantum potential is itself determined fom the quantum wave PSI, which contains contributions from all other objects in the particle's environment. Since Q does not necessarily fall off with the intensity of the wave, this means that even distant features of the environment can affect the movement in a profound way. As an example, consider the famous double slit experiment. This is generally taken as the key piece of evidence of the wave-particle duality of quantum particles, and that this duality is intrinsic to such a particle ( In the current interpretation one says, it is either a particle -- or shows particle-like behavior -- or a wave -- or behaves in a wave-like fashion -- dependent on the way it is observed). When electrons are sent from a source to a screen with two slits, they exhibit a wave-like interference pattern on a screen placed behind the screen with the two slits, which is quite "incommensurable" with the classical behavior of particles : An electron from the source encounters the double slits and can evidently only go through one of the slits. It ends up being registered on the screen that is placed some distance behind the double slit screen. After very many of such individual events a pattern begins to built up on the screen. The conventional interpretation is that this interference pattern is evidence of the wave-like nature of the electron. In the causal interpretation, however, the pattern is a direct result of the complex quantum potential : The electron travels toward the screen containing two slits. Again, clearly it can go through only one slit or the other. But the quantum wave can pass through both. On the outgoing side of the slit system, the quantum waves interfere to produce a higly complex quantum potential which does not generally fall off with the distance from the slits. The potential is illustrated below. Figure 2. The quantum potential for the two slit system. After BOHM and PEAT, 1987. Note the deep valleys and broad plateaus. In those regions where the quantum potential changes rapidly, there is a strong force on the particle which is deflected, even though there is no classical force operating. The movement of the electron is therefore modified to produce the scattering pattern ( In fact we must say that the movements of the electrons is therefore modified, because the scattering pattern results from many electrons 'fired' one after the other from the source towards the screen with the double slits.). In this case, the wavelike properties do not arise in any essential duality of the quantum particle but from the complex effects of the quantum potential, i.e. such a particle does not intrinsically have this duality (Which means that the explanation by the causal interpretation of the results of the double slit experiment is different from that by other interpretations of quantum theory). The explanation of the quantum properties of the electron given above emphasized how the form of the quantum potential can dominate behavior. In other words, information contained within the quantum potential will determine the outcome of a quantum process. Indeed it is useful to extend this idea to what could be called active information. The basic idea of active information is that a form, having very little energy, enters into and directs a much greater energy. This notion of an original energy form acting to 'inform', or put form into, a much larger energy has significant applications in many areas beyond quantum theory (Think of the ship with its automatic pilot, or just of an ordinary radio receiver). The quantum wave carries 'information' and is therefore potentially active everywhere, but it is actually active only when and where this energy enters into the energy of the particle. But this implies that an electron, or any other elementary particle, has a complex and subtle inner structure that is at least comparable with that of an automatic pilot device or radio. Clearly this notion goes against the whole tradition of modern physics, which assumes that as matter is analyzed into smaller and smaller parts, its behavior grows more elementary. By contrast, the causal interpretation suggests that nature may be far more subtle and strange than was previously thought. But this inner complexity of elementary matter is not as implausible as it may appear at first sight. For example a large crowd of people can be treated by simple statistical laws, whereas individually their behavior is immensely subtler and more complex. And what of the subatomic particles themselves? It is interesting to note that between the shortest distance now measurable in physics, 10-16 cm, and the shortest distance in which current notions of space-time probably have meaning, 10-33 cm, there is a vast range of scale in which an immense amount of yet undiscovered structure could be contained. Indeed this range is roughly equal to that which exists between our own size and that of the elementary particles. A further feature of the causal interpretation is its account of what Bohr called the wholeness of the experimental situation. In, for example, the double slit experiment, each particle responds to information that comes from the entire environment. For while each particle goes through only one of the slits, its motion is fundamentally affected by information coming from both slits. More generally, distant events and structures can strongly affect a particle's trajectory (in a non-local way) so that any experiment must be considered as a whole. This gives a simple and tangible account of Bohr's wholeness, for since the effects of structures in the environment may not fall off with distance, all aspects of the experimental situation must be taken into account. But if this is the case, then how can the classical world, with its separate and distinct objects, manifest itself? The answer is that in those limits (i.e. in that range) in which the quantum potential can be neglected, its information is no longer active and objects behave as if they were separate and independent. This limit, of negligible quantum potential, is in fact the 'classical limit'. A further feature of the causal interpretation is that it avoids breaks and discontinuities of interpretation. One of the most serious of these, in the conventional approaches, involves what is called the "collapse of the wave function". The behavior of electrons, or other elementary particles, is described conventionally in terms of a wave function (this is formally identical to the quantum wave PSI of the causal interpretation). According to the Schrödinger equation (which is the basic equation in quantum theory), this wave function can change only in a smooth and continuous way. However, the results of any quantum mechanical measurement make sense only if it is assumed that the wave function "collapses" in a sudden and discontinuous fashion. Since this collapse is not covered by the Schrödinger equation, and indeed appears to violate it, an additional assumption or some other interpretation is required to explain this "collapse of the wave function". However, in the causal interpretation, the measurement process takes place in a fashion that is entirely natural to the formalism and no additional assumptions are needed. These considerations are particular significant when the theory is extended to include cosmology. The origin of the universe in a "big bang" is at one and the same time a cosmological and a quantum mechanical problem. For if energy and matter are created out of a singularity, a vanishingly small region of space-time, then clearly quantum mechanical processes must be involved. But how are these processes and their outcomes to be discussed when the only conceptual framework, in the conventional approach, also involves classical measuring apparatus (in order to let collapse the wave function)? In the causal interpretation an objective universe can be assumed that is not dependent on measuring apparatus or observers. By contrast, the alternative interpretations either involve a number of extraneous assumptions, or they suppose, along with Bohr, that nothing whatever can be said of the "quantum world". And thus in the causal interpretation the informal language coheres with the mathematics and enables an intuitive account to be made of the underlying quantum processes. A particular interesting feature of the causal interpretation is that it is not limited to the formal structure of current quantum theory. Its mathematical basis is open to an almost unlimited range of modifications that go far beyond current quantum theory, while still cohering with the informal language of the causal interpretation. All these modifications involve new levels of Reality beyond those in which the laws of the current quantum theory are valid. For example the particle paths described earlier may turn out to be only averages of a more complex set of trajectories (resembling those of Brownian motion) which reflect new levels of Reality (D. BOHM and J.P. VIGIER, Physical Review, vol. 96, no. 208 (1954)). These paths fluctuate chaotically to bring about, in the long run, the same sort of statistical distribution that is predicted in the current quantum mechanics (But now those movements are individually visible). This shows that the interpretation, while being causal, is not strictly deterministic. The possibility is opened for creativity to operate within a causal framework. Extensions of the theory involve the introduction of still other types of potentials, in addition to the classical and quantum. There is also the question of an experimental test between the causal and the conventional approaches. A particular extension of the causal interpretation shows that there exists a characteristic "relaxation time", such that if quantum measurements are carried out in short enough time intervals, the statistical results will differ in an important way from those of current quantum theory. It is therefore possible to distinguish experimentally between the predictions of the two theories. However, at present (1987), these relaxation times are too short for existing experimental techniques. (However, I think that the main reason of not considering the causal interpretation as a serious candidate, is that it postulates one or several "new levels of Reality" (that cause the quantum effects). Such a postulation tends to make the quantum theory imcomplete because of "hidden variables" or "hidden orders". In all this, current quantum theory could turn out to be just an abstraction and approximation to the real state of affairs. This really must disturb the quantum theory devotees. But in fact they should welcome it, because if correct, the new theory makes the world an even more interesting and subtler place than it already is. And the men of science should be modest about the theories they nurture, and be content with the almost certain fact that those theories are just approximations, how far they may be developed. An extra reason for not taking the causal interpretation seriously is that the mentioned new fundamental levels of Reality are more complicated and subtler than the less fundamental levels -- among which the explicate order of everyday objects. This is contrary to the well accepted notion that more fundamental levels are more simple in structure and behavior. Indeed, some general elements in BOHM's view of "all of Reality" reminds us very much of a Neoplatonic motif as we see it for example in the writings of the ancient Greek philosopher Proklos (fifth century) ). A particular objection appears to arise from what scientists call the non-local nature of the approach. This can be explained in the following way. When several particles are treated in the causal interpretation then, in addition to the conventional classical potential that acts between them, there is a quantum potential which now depends on all the particles. Most important this potential does not fall off with the distance between particles, so that even distant particles can be strongly connected. This feature, in which very distant events can have a strong influence, is what is meant by a non-local interaction and is strongly at variance with the whole spirit of classical mechanics. There is a great reluctance on the part of the physicists (1987) to consider such non-locality seriously, even though it does lie at the heart of the formal implications of quantum theory. Because theories in terms of local interactions have been so successful over the past few centuries, the concept is now seen as both necessary and inevitable. But, in fact, there does not appear to be any intrinsic reason to rule out non-local forces. However, a general attitude has arisen out of the tacit infrastructure of ideas over the last few centuries which prejudices scientists to any serious consideration of non-locality. If the objections to non-locality are based on an almost subliminal prejudice, can they be backed up by physical argument? One suggestion is that non-locality is inconsistent with the basic tenets of relativity (i.e. Einstein's theory of relativity). Non-locality implies an instantaneous connection between distant events, and this appears to violate the basic principle of relativity that no signal can travel faster than light. However, a more detailed analysis shows that the quantum potential is very 'fragile' and unstable to alternations. In other words, if any attempt is made to impose a form on the potential and thereby use it as a signal, this form will become mixed up and lose all order and meaning. The quantum potential cannot therefore be used to carry any signal between distant effects and therefore its instantaneous connection of distant particles does not violate the theory of relativity. Indeed, there is suggestive evidence that rather than violating physical laws, non-locality does in fact operate in nature. An experiment initially suggested by Einstein, Rosen, and Podolsky depends upon measuring the non-local effects of one distant quantum particle on another (These two particles must once have belonged to one and the same system). In 1981 this experiment has been carried out in Paris by Alan Aspect and interpreted with the aid of a theorem of J.S. Bell. It provides strong evidence for a non-local form of interaction. This result follows in a natural way, within the causal interpretation, as a result of the non-local quantum potential that directly connects distant particles. On the basis of the causal interpretation of quantum theory we must indicate a new level of Reality that is associated with the quantum potential, and as such responsible for the behavior of quantum particles as found in quantum theory. This new reality level can be imagined as a new order, in the sense that it is timeless, although it is in a thorougly 'dynamic' state or flux. It is in a sense a hidden order and at the same time the dynamical ground for at least many quantum processes, or, in other words, a generative order for several quantum features. BOHM calls it the (first) implicate order. As such it carries the explicate order which comprises our everyday objects and processes, but also apparent trajectories of elementary particles. Within the implicate order everything is connected. We can also say that everything in the explicate order is (more or less) connected via the implicate order (or orders). There is a constant 'dynamics' of enfoldment and unfoldment : relative autonomous subtotalities unfold from the implicate order into the explicate order, only to be enfolded again later on into the implicate order. So because of the non-local nature of the implicate order and its tight dynamic connection with the explicate order, the world is undivided wholeness. Later we will present a very instructive analogy to the implicate order, which especially throws much light on the unfold-enfold dynamics. In the foregoing we have given BOHM's first version of the causal interpretation of quantum mechanics. There we departed from the particle. But in modern quantum theory the field has become more fundamental than the particle, because the particle emerges from the field. And so we have quantum field theory. Let us say something more about those fields. Maxwell's equations concerning the electromagnetic field, constituted the first fully worked out field theory, one that applies to both electricity and magnetism, and that says that magnetism is equivalent to moving (dynamic) electricity. It is the classical (meaning non-quantum) theory of electrodynamics. Einstein's General Theory of Relativity describes the other force familiar from everyday life (gravity) and is another classical (in the same sense) field theory, this time of gravity. In the old, classical view of the world there were two basic components : material objects and the fields that linked them. But the field is now the ultimate, fundamental concept in physics, because quantum physics tells us that particles (material objects) are themselves manifestations of fields. One of the first great surprises of quantum physics was the realization that a particle, such as an electron, had to be treated like a wave. In this first application of quantum principles we learn to treat these matter waves as fields, with one field corresponding to each type of particle. For example, there is a general matter field filling the Universe, which is described by the wave function of an electron (Strictly speaking, the wave function describes electron-positron pairs). But, as the discovery that electromagnetic waves must also be regarded in particle terms showed, a field can be directly responsible for the existence of particles. Indeed, in the quantum world a field must give rise to particles. Quantum physics says that the energy in the field cannot be smoothly changing from place to place, continuously, as in the classical picture. Energy comes in definite lumps called quanta, and every matter field must have its own quanta, each with a definite amount of energy, or mass. The particles are energetic bits of the field, confined to a certain region. A photon is a quantum of the electromagnetic field. In the same way, by applying quantum principles a second time to the matter fields of electrons, we find that we recover the idea of the electron as a particle, as the quantum of the electron matter field. This interpretation of particles as "field quanta" is known as second quantization. It tells us that there is nothing else in the Universe except quantum fields. Returning now to the implicate order, to obtain a deeper and more extensive understanding of that order, it is necessary to start from quantum mechanical field theory. This is, in essence, the most basic and general form of the modern quantum theory that is available to date (as BOHM and PEAT report, 1987). Such a step will lead to an extension of the implicate order, called the superimplicate order. This is much subtler than the implicate order and goes deeper. In addition, it is capable of further extensions in ways that go beyond quantum theory altogether. As with the quantum mechanical particle theory, it is necessary to proceed from the standpoint that the mathematical formalism of the quantum field theory is essentially correct, at least within some suitable limits. However, the informal language describing physical concepts is even more unclear in the field theory than it is in the particle theory. The causal interpretation will therefore be extended in order to obtain a clear physical notion of the quantum field theory, as well as to gain insight into the superimplicate order. To be more specific, the key new property treated by quantum field theory is the appearance of discrete particle-like quanta (as a result of second quantization), in what was initially assumed to be a continuous field. In the causal interpretation, a clear and well-defined physical concept of the appearance of discrete particle-like quanta in a continuous field can be given. This interpretation fully and faithfully expresses the meaning of the mathematical equations. It must be emphasized, however, that although the particular example of the superimplicate order is obtained from the causal interpretation of quantum field theory, the essential idea of the superimplicate order is not restricted either to the causal interpretation or to the quantum theory itself. Rather, these are only special forms of the more general superimplicate order. The basic discussion of quantum field theory in terms of the implicate order and the causal interpretation is quite simple. Instead of taking a particle as the fundamental reality, start with the field. And instead of having a particle acted on by a quantum potential, suppose that the field is acted on by a superquantum potential. This superquantum potential is far subtler and more complex than the quantum potential, yet the basic principles governing its behavior are similar. Its net effect is to modify the field equations in a fundamental way so they become non-linear and non-local. This brings about the new quantum properties of the field. The field is continuous and by itself would tend to spread out from any source. However, because the superquantum potential is non-linear and non-local, it is able, under certain conditions, to provide a very subtle kind of immediate connection between distant regions of the field. Suppose, for example, that the field meets an atom that can absorb a definite amount of energy. The superquantum potential will 'sweep in' energy from the whole field, in a definite amount equal to what can be absorbed by the atom. This explains how a continuous field can act in matter as if it were made up of discrete elementary units. In the particle treatment (i.e. the first form of the causal interpretation discussed above), the wave-particle duality was explained as an effect of the quantum potential on the particle. But the wave-particle duality can now be treated as an effect of the superquantum "field" on the original field itself. Therefore, the particle is no longer used as a basic concept, even though the field manifests itself in discrete units, as if it were composed of particles (The field becomes a quantum field by the action of the superquantum potential.). So far the implicate order has not been brought in. In the causal interpretation of the field theory there are two implicate orders in a specified relationship. The first implicate order is just the field itself, and its movement, as described by so-called Green's functions, is just a form of the implicate order. The second implicate order is then obtained by considering the superquantum wave function. This is related to the whole field as the original quantum wave function is related to the particle (The mentioned wave functions figure in the corresponding potentials.). A more detailed treatment shows that the superquantum wave function also moves in a kind of implicate order which is, however, far subtler and more complex than is the first implicate order. This then comprises the second implicate order. In the earlier version of the causal interpretation, the quantum potential represents information which guides the self-active movement of the particles. In the field case, the superquantum potential now represents information that 'guides' or organizes the self-active movement of the field. The first implicate order applies to the original field (considered as not quantized) which, however, now has new features brought about by the action of the superquantum potential. And the second, or superimplicate, order applies to the 'super field' or information, that guides and organizes this original field. A good analogy to the first and second implicate orders is provided by considering a computer or video game. The first implicate order corresponds to the television screen, which is capable of showing an indefinite variety of explicate forms, which are essentially manifestations of an implicate order. In earlier television sets this could clearly be seen through the action of the synchronizing adjustment. When synchronism failed, the images would be seen to enfold into an apparently featureless background. But when the correct adjustment was made, the hidden images would suddenly unfold into explicate forms again. The second implicate order corresponds to the computer, which supplies the information that arranges the various forms -- spaceships, cars, and so forth -- in the first implicate order. Finally the player of this game acts as a third implicate order, affecting the second implicate order. The result of all this is to produce a closed loop, from the screen to the player to the computer and back to the screen. Such a loop is, in a certain sense, self-sustaining, for with only the computer and the screen in operation, all that would happen would be an unfoldment of a predetermined program. But when the player, as third implicate order, is introduced, a closed loop results and the possibility is opened up of a genuine dynamic developement in time, in which creative novelty may enter. We could speculate that, in nature, there is something like a third implicate order that affects the second and is affected by the first, thus giving rise again to a closed loop. Or more generally there is an indefinite series, and perhaps hierarchies, of implicate orders some of which form relatively closed loops and some of which do not. Of course such an idea implies that the current quantum theory is of limited validity. This theory is covered only by the first and second implicate orders. Where anything beyond the second implicate order is active, then quantum theory would no longer be valid. (BOHM and PEAT, 1987). In the quantum field version of the causal interpretation, an elementary particle is taken to be the manifestation of an underlying quantum field. The particle therefore represents the folding of a field into a localized region. Likewise the annihilation of the particle is the unfolding back into the field. In this way the complex reactions of elementary particles can be thought of as enfoldings and unfoldings within a dynamic background (See PEAT, 1987, Synchronicity, The Bridge between Matter and Mind). In the above expositions we have seen that modern physics calls for at least two implicate orders that are responsible for the behavior of quantum entities. But in the usual interpretations of quantum theory it does not seem to be possible to maintain the notion of the interweaving of the orders of chance and necessity as abstractions from infinite order with unlimited creative potential, as is attributed to the implicate and generative orders. The principal difficulty arises because a system of particles cannot simply be treated by analysis into independently existent but interacting constituent particles. Rather, the quantum theory implies a certain quality of wholeness in the sense that a system cannot be dealt with properly as a set of separate parts. Hence in the usually accepted interpretation, there is no way to discuss how randomness might arise. Randomness (as deduced from quantum mechanical experiments) is therefore assumed to be a fundamental but inexplicable and unanalyzable feature of nature, and indeed ultimately of all existence. Such an approach complements Bohr's notion of the inherent ambiguity of concepts at the quantum mechanical level. For within the range of this ambiguity, the quantum theory implies that the experimental results will fluctuate with an irreducible kind of randomness. And thus the very nature of the quantum mechanical ambiguity will imply a coresponding limit to the possibility of meaningful order. On the present more or less alternative Part of our website -- alternative with respect to the First and Second Parts -- however, we, along with BOHM and PEAT, propose the notion that everything that happens takes place in some order (which, however, depends on broader contexts for its meaning). Therefore, while there is ambiguity within particular contexts, the notion of an ultimate limit to the meaning of order, a limit that holds in all possible contexts, is not admitted (while in the current interpretation of quantum mechanics one identifies such a limit with respect to quantum mechanical concepts). For example, above, the causal interpretation of quantum theory was discussed in which a further kind of order is proposed. This order, which underlies the randomness implied in the probabilistic laws of the quantum theory, can be understood as the causally determined motion of the particle under the quantum potential. Because this latter potential gives rise to a complex and highly irregular force, the motion will in general be fairly chaotic. In such complex systems, an essentially random order is to be expected which explains the probabilistic assumptions of the theory. Deterministic movements at a lower level explain and determine the random movements at a higher level (The former is the implicate order, while the latter is the explicate order in which observations take place). However, such a simple deterministic theory (involving the causal action of the quantum potential) is an abstraction, which is valid only up to a point. Beyond this point, one may have to consider the possibility that even the basic laws of the particles involve orders of infinite degree, which reflect levels of reality beyond those treated adequately by the current quantum theory. In a certain approximation, this may be considered as a random order. But the motion may more generally be in an order of very large or infinite degree, which is in the rich domain between simple orders of low degree and infinite chaotic or random orders. When understood in terms of the causal interpretation, the quantum theory is therefore capable of fitting into the general notion of the interweaving of chance and necessity, considered as lying at the extremes of an infinitely rich order that is context-dependent. In quantum theory this order is at present hidden in the context available so far in physics, because -- as say BOHM and PEAT -- science has not been able to respond with the necessary subtlety of meaning. But in contexts that may one day be discovered, new possibilities for creativity within such orders may be revealed, and these context orders will then cease to be 'hidden'. The notion that both simple regularity and randomness in a given context may contain orders that are 'hidden' in that context, but which can be revealed in other contexts, is of quite general significance. For example, the order of a language or music cannot be found by studying the regular orders of vibration in sound waves, or the almost random orders of motion of the molecules in the air that carries them. Indeed, unless the mind is free of rigid commitments to familiar notions of order, it cannot provide a context within which basically new orders might be perceived. (BOHM and PEAT, 1987). It is in our context instructive to ask oneself the question as to what the status is of natural laws (physical laws). Of course in science they are first of all mathematical descriptions, i.e. abstractions in thought. They refer to more or less idealized and often simplified situations, and express certain definite restrictions, under which certain processes proceed. It is only by restrictions that we get something definite, i.e. that we can expect that processes follow certain definite pathways, and not others. Whether such laws are correct(ly stated) (by scientists), experience and experiments will decide. In the following discussion we assume those laws to be correct, and ask ourselves whether as such they subsist somewhere in Reality, or are still just descriptions of fundamental restrictions, descriptions toward which scientists strive to finally obtain. In other words are natural laws immanent in matter (or in Reality as such), or not? Well, it seems, to treat physical laws as if they were somehow immanent in matter has all the appearance of a logical blunder. To argue, for example, that the Second Law of Thermodynamics causes the running down of a clock, or of the steam engine, seems to be as muddled as to suppose that a football commentary actually determines the state of the game. Science has always treated its laws as just mathematical abstractions, descriptions after the fact, rather than laws in the judicial sense that determine and direct behavior. Therefore to speak of such laws as being manifest or realized in matter, so that they play a formative role, sounds absurd. But suppose that this orthodox view of science is strictly limited. Suppose that, at some level, a formative and ordering principle does indeed operate within the universe. Such a principle would act to generate the novel forms and structures of nature and would be the motivating force behind all patterns and conjunctions. Clearly a formative principle must be very different from what is normally meant by "a law of nature", which is the abstraction and generalization of scientific experience. But what then could it be, this principle of animation and generation that differs in such a radical way from the conventional laws of physics? This question, and the foregoing discussion, was put up by PEAT, in Synchronicity, The Bridge Between Matter and Mind, 1987. My preliminary answer would be that genuine dynamical laws, each of them governing a certain dynamical system, that generates one or another intrinsic pattern, could be at least an aspect of such a principle of animation (formative principle). As stated in the First Part of our website, such a dynamical law is immanent in the elements of the given dynamical system. So what, if at least such laws, provided they are correct, are not simply abstractions of experience but are the realization of something that is creative, generative, and formative, i.e. of something that lies beyond language and thought? This generative power cannot lie within the mental or material worlds alone but rather has its place in some, as yet unexplored, ground that lies beyond the distinctions of either. The nature and name of this generative power should by now be recognizable to the reader on the basis of the above discussions about the explicate and implicate orders. We could, alternatively, refer to it as 'objective intelligence' or 'creative ordering' that manifests itself in both the mental and the physical realms. Normally this ordering is only dimly grasped. The Implicate Order (or set of such orders) is ultimately carried by the Holomovement (Holoflux). This Holomovement is an unbroken and undivided totality. In certain cases, we can abstract particular aspects of the Holomovement (e.g. light, electrons, sound, etc. ), but more generally, all forms of the Holomovement merge and are inseparable. Thus, in its totality, the Holomovement is not limited in any specifiable way at all. It is not required to conform to any particular order, or to be bounded by any particular measure. Thus, the Holomovement is undefinable and immeasurable. To give primary significance to the undefinable and immeasurable Holomovement implies that it has no meaning to talk of a fundamental theory, on which all of physics could find a permanent basis, or to which all the phenomena of physics could ultimately be reduced. Rather, each theory will abstract a certain aspect that is relevant only in some limited context, which is indicated by some appropriate measure. Above : Reductionistic Physics finds ultimate simple building blocks out of which all of Reality has emerged. Below : The ultimate ground of all Reality is unbounded, undefinable and immeasurable. It is the Holomovement, out of which everything emerges and to which everything returns, in an ever to and fro process. The theory of the Implicate Order can be philosophically developed along several directions. These developments may then serve as tests as to whether the theory as such is or is not on the right track leading to a global understanding of Reality. One of the possibilities for further development is to combine it with the ontology of Nicolai HARTMANN (1940) which is about spheres and layers of Being within all of Existence (whether ideal or real). This ontology is highly interesting and promising, but it also presents several difficulties. In Fourth Part of Website Part I, we have tried to remedy these difficulties, resulting in a long, but -- I think -- interesting discussion of Layers of Being. And in Part XXIX Sequel-1 (of this same Fourth Part of Website) we have, on the basis of some very plausible assumptions, finally solved these difficulties by combining HARTMANN's theory with the theory of the Implicate Order, and with MEYER-ABICH's theory (1948) of Holistic Simplification. All this results in a general theory of coupled orders of form generation : Reductionistic Complexification (Explicate Order) coupled with Holistic Simplification (Implicate Order), and Layers of Being. In Part XXIX Sequel-2, Part XXIX Sequel-3 and Part XXIX Sequel-4 of the menioned Fourth Part of Website, this theory is further exemplified by the structure of plants (phyllotaxis) and the symmetries of snow crystals. Recently, I have picked up the idea of the Implicate Order again, especially in an attempt to rationalize the perplexing phenomenon of organic evolution. It is argued for in Fifth Part of Website , in the Series on Evolution (after the issues of Aristotelian logic and metaphysics, and Intentional Logic). It is argued there that the current neo-darwinian explanation of the driving force of organic evolution, namely by seeing this force exclusively to be random genetic mutation and natural selection, only -- if at all -- holds for events at merely the sub-species level. For explaining all long-time evolutionary lineages it fails miserably. It cannot explain in this way the many intricate and 'clever' adaptations having arised in the animal and plant world in the course of geologic time. In conceptually isolating one such adaptation in a given organismic species, that is, when neglecting the evolution of all the other organ-systems and behavior of the individuals of such a species, the neo-darwinian explanation of the evolutionary origin and generation of such an adaptation by a succession of random genetic changes and subsequent natural selection, appears, when not too critically looked at, plausible. But as soon as the true nature of random genetic changes is taken into account, this explanation of that (chosen) adaptation fails. And things become even worse when it is (rightly) demanded that, considering evolution, the whole organism must be taken into account, beause all its many different organ-systems and behavior are subjected to evolution in a constantly changing environment (especially its biotic part). And then explanation by random genetic mutation and subsequent natural selection of the 'fittest' mutants breaks down and is drowned in a mass of ad hoc assumptions. The organisms chosen by me to consider in this respect are the insects, because, firstly, they offer almost all aspects of evolution, secondly because they are by far the largest and most diverse organisms, with a long evolutionary history (from the Carboniferous onwards), and thirdly, because I am well acquainted with these creatures. My alternative general theory of organic evolution is step-by-step developed on that Fifth Part of Website while considering the morphology and behavior of, to begin with, the representatives of the insect Orders Diptera (mosquitoes, gnats, and true flies) and Hymenoptera (wasps, ants, and bees). In my theory it is assumed that Reality consists of two interacting Orders of Being, the Explicate and the Implicate Orders. It is then further assumed that the processes of organic evolution do not actually take place in the Explicate Order (the material, physical world) but in the Implicate (the immaterial, "noëtic" order). There it takes place in the form of formal derivations of certain noëtic patterns (themselves each being a 'description' of a certain strategy to exist in the Explicate Order) from other such patterns. Upon 'projection' from the Implicate Order into the Explicate Order this derivational sequence appears in the Explicate Order as a succesive appearance of different organisms and organismic types. As has been said, this theory is being gradually developed in Fifth Part of Website during the many considerations about the morphology and way of life (in hymenoptera especially that of reproduction) of concrete Diptera and Hymenoptera. Only near the end of treating of the Hymenoptera (where the evolution of ants and their social behavior is discussed) the general theory of evolution -- the noëtic theory of evolution -- attains a more complete form. And there the original conception (by BOHM) of the Implicate Order, and also that of the mutual interaction of the two Orders, is, as conscientious as possible, changed a bit. We hope to have succeeded in better (than neo-darwinism) rationalize the phenomenon of organic evolution by placing it in a broader metaphysical context, without introducing any theological or related considerations. For the reader who is interested in this new "noëtic theory of evolution" it would be useful to start with the present document on the Implicate Order, and then move on to the Series on organic evolution in Fifth Part of website. In the next document we will extensively treat of a very instructive analogy to the implicate order (i.e. to any implicate order). After that we will constantly make use of this analogy to explain and speculate about the role that implicate orders play in the fabric of Reality. As we did in the present document, we again will make extensive use of the expositions of BOHM, 1980/88, Wholeness and the Implicate Order, and of BOHM and PEAT, 1987, Science, Order, and Creativity. But we will also try to develop BOHM's idea of Wholeness further, especially by philosophical means. We will see that all of Reality, i.e. inanimate matter, as well as animate matter, and also consciousness, and, yes, all of the cosmos, originates from a common ground that is, instead of being more simple, very complex and subtle, and more or less mind-like. Is this ground the absolute end of everything? In the proposed views concerning the general nature of 'the totality of all that is' we regard even this ground as a mere stage, in the sense that there could in principle be an infinity of further development beyond it. At any particular moment in this development each such set of views that may arise will constitute at most a proposal. It is not to be taken as an assumption about what the final truth is supposed to be, and still less as a conclusion concerning the nature of such truth. Rather, this proposal becomes itself an active factor in the totality of existence which includes ourselves as well as the objects of our thoughts and experimental investigations. Any further proposals on this process will, like those already made, have to be viable. That is to say, one will require of them a general self-consistency as well as consistency in what flows from them in life as a whole. Through the force of an even deeper, more inward necessity in this totality, some new state of affairs may emerge in which both the world as we know it and our ideas about it may undergo an unending process of yet further change.